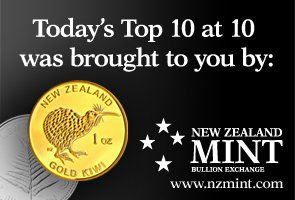 Here are my Top 10 links from around the Internet at 10 past 1 pm, brought to you in association with New Zealand Mint for your reading pleasure. I welcome your additions and comments below, or please send suggestions for Thursday's Top 10 at 10 via email to bernard.hickey@interest.co.nz. Remember that registered commenters can more easily include links out in their comments. Use the box in the right hand column to register. We're turning off unregistered comments from this Sunday September 12. 1. Hubbard's halo dented - Yay!. Chalkie is finally online after years stuck in print in the now defunct Independent weekly newspaper. Chalkie has commented on Stuff's BusinessDay that Allan Hubbard's halo is well and truly dented. Chalkie is concerned most with Hubbard's operation of Aorangi Securities and Hubbard Management Funds. Whilst the gloves have come off - pointing out Mr Hubbard's failing as a lender, his controlling attitude, an inability to listen to advice and inter-company dealings etc - Chalkie reckons the media generally has missed the most damning behaviour of all. Chalkie has the most problem with Mr Hubbard's behaviour is with his funds management operation, through the lending of Aorangi and what is known as Hubbard Management Funds (HMF). Although a sideshow in terms of scale and money lost, if ever Mr Hubbard is to be dragged before the courts it will probably be over this side of the business. Chalkie asks some very pointed questions about Allan Hubbard's behaviour. The first possible explanation Chalkie can think of is that the fund manager never had that extra $5.65 million in cash and $5m in shares - that the figures were made up to boost investor returns. The boosting of investor returns by simply making up numbers with the aim of either drawing in more money or (typically near the end) stopping money flowing out is a core element of a Ponzi scheme. Given Mr Hubbard wasn't doing a Bernie Madoff and living the high life on investors' money HMF was not a Ponzi scheme, but if it was misleading about the returns investors were achieving this reeks of appalling ethics not consistent with what was previously thought to be known about Mr Hubbard. 2. 'Gaming the government' - Fran O'Sullivan writes in the NZHerald that the South Canterbury Finance receivership scenario might have been different if it had happened after the earthquake. Fran also thinks George Kerr and various bond holders have gotten off lightly amid the public furore. I tend to agree. However, she says criticism of Allan Hubbard is unfair. I tend to disagree. I suspect the uproar of hatred that has been pouring out against South Canterbury founder Allan Hubbard on far too many uncontrolled websites over the past week would have instead been directed against a Government arguably looking after well-heeled opportunists to whom it did not owe a red cent as they were not covered by the guarantee scheme. The furore against Hubbard has been immense. I hold no brief for him. But the anger against him is fundamentally unhinged. Hubbard did sign across good assets such as the stakes in apple exporter Scales Corporation, the Helicopter Line and a third share in Dairy Holdings to South Canterbury. The Government has paid out "in the know" bond investors and foreign preferential shareholders who did not qualify for the guarantee. Forget about moral hazard - the smart money now knows that the Key Government can be "gamed". 3. Video of the Earthquake - Here's some CCTV footage from a Christchurch Noel Leeming of the Saturday earthquake in real time. 4. China's real estate fraud - David Pierson at the LA Times reports from Hangzhou on just how mad the real estate market there is. It shows the potential risk of a big bang in the Chinese economy and is another warning for those who think China's city apartment bubble is remotely sustainable. HT Erica via Twitter. Hordes of buyers snapped up luxury apartments, buying out some projects within hours based on little more than floor plans. Powerful developers listed properties whose prices seemed more suitable for Beverly Hills. And the local government, flush from sales of public land to builders, built itself a $650-million headquarters. Hangzhou is a cautionary tale of the challenges faced by China's central government, which is trying to curb galloping housing prices without hobbling the economy. Societal pressure is growing as more ordinary residents in Hangzhou and other cities are being priced out of the market. But an abrupt pullback could jolt the banking system and cripple an industry that accounts for about a fifth of the nation's economy. All land in China is owned by the state, but it can be "lent" to developers — for a price. Such sales used to be conducted behind closed doors; builders needed connections to powerful bureaucrats to prosper. Seeking transparency — and more revenue for Beijing, which splits taxes with local governments — China's central planners in 2004 ordered all such transactions to be allocated through public auctions. This new competition boosted land sales nationwide, but demand was particularly frenzied in Hangzhou. Last year the local government generated $1.6 billion in land sales, more than any other city in China. Experts said up to half of Hangzhou's housing market has been driven by investors rather than homeowners — double the estimated national rate. In this no-holds-barred environment, raising capital was easy if you knew how. In a scheme called "returning the flat," small groups of speculators would sell the same property to each other to drive up the listed value of a home. With each transaction, the next speculator could obtain a larger mortgage, using the excess cash from the lender to invest in other properties. The conspirators would then divide the profits once they unloaded the property outside their circle. "A flat could be worth 10 times more by the time they were done," said Chen Zhencheng, director of the National Real Estate Management Alliance, who said that the practice broke no laws. "This was happening in 30% to 50% of some building projects. The places were full of speculators." 5. 'Rising global interest in farmland' - It turns out New Zealand is not the only place worried about cashed up foreigners buying productive farmland. It's also happening in many developing economies. The World Bank has written a 164 page report on the issue titled "Rising global interest in Farmland: Can it yield sustainable and equitable benefits." HT John Walley via email. “When done right, larger-scale farming can provide opportunities to poor countries with large agricultural sectors and ample endowments of land,” the report states. The bank, nonetheless, does not endorse all the investments and it also criticises strongly some of the deals for depriving local communities of their arable land. The study is the broadest yet of the rapidly growing trend in which countries or their proxies invest in overseas land to boost their food security. “The magnitude and often speculative nature of land transactions observed recently has caught many actors by surprise,” the World Bank says on its report. Juergen Voegele, director of agriculture at the World Bank, says in the report that “given commodity price volatility, growing human and environmental pressures, and worries about food security”, interest in farmland is rising. “The demand for land has been enormous,” he writes in the study’s preface. Here's the FT's report on the report, which says the World Bank supports such sales, but is urging the sellers to be careful and to ask for a lot of dosh up front. 6. Tax break is off - The 50% tax break on the first A$1,000 of interest on bank term deposits in Australia was a bit of model for proponents of a similar tax break in New Zealand. Now it has been delayed for a year because the new Labour government needed to save A$700 million to pay for its regional broadband bribe for two independent MPS, The Australian reports. 7. Natural Dairy's more limited ambitions - Natural Dairy's financial backers in Hong Kong and China are scaling back their acquisition plans in New Zealand, but are pushing ahead with the Crafar Farms acquisition and plans to build a UHT packaging plant in Tauranga, Karyn Scherer reports in the NZ Herald. May Wang's star may be waning and the dealings in Hong Kong are murky at best. The company has also revealed it may have to write down the value of its mining assets by about $42 million, because of a deal it has labelled "unauthorised, invalid, fraudulent and unlawful". Before Auckland businessman Jack Chen engineered the reverse takeover of Natural Dairy last year, the Hong Kong listed company was known as China Jin Hui Mining. 8. China may unleash a monster - China is looking at allowing its farmers to borrow against land they work on, but is owned by the state. This could have a monumental impact on the Chinese economy, unleashing a huge amount of wealth and consumer spending, Leo Lewis at The Times reports. The government has been pilot-testing what would happen if it allowed farmers in a scattering of provinces to use their land as loan collateral. The effects have been remarkable. Given the opportunity, the farmers have borrowed twice as much as those still bound by the national law. If you are Beijing and you are trying to generate a consumer revolution, those are fairly enticing results. When it published those loan numbers, the regulator said that "financial products designed for farmers and rural development will be offered across the country". Some think this means that the pilot scheme is going to go national by the end of this year. According to Glenn Maguire, head of China economics at Societe Generale, if it does we may be looking at a monumental unleashing of rural consumerist power and potentially the biggest economic stimulus ever conducted. Anywhere. Letting the farmers borrow against their land could give Beijing the elusive tools it needs to rebalance and conjure up a second economic miracle when the first hasn't even begun to lose its wow factor. 9. Do we trust the money? - Britain's De La Rue, the world's largest printer of money, is being investigated after it deliberately falsified tests on paper to make notes, the New York Times reported. The CEO has resigned and there are now questions about its credibility. This is a bad thing for the printer of 150 of the world's currencies. It is being investigated by Britain's SFO. Gold anyone? 10. Totally irrelevant video - Here a Mercedes driver makes a mistake. Then compounds a mistake. Then makes it worse. Then drives off. A lesson in how not to dig yourself even deeper in the mire. 2 separate items up there, say that the Chinese government OWNS ALL LAND in China, and just "lends" it to people for a price. Are Chinese investors buying our land because they aren't allowed to buy their own? Is there some strategy involved here? We'd be stupid to forget what is "the nature of the beast" when it comes to the CCP. I love Asians. I hate Communists. There was a BBC interview recently with the senior economist from HSBC in London. He said that it was wrong to only blame the subprime housing market for the recession, but rather it was outsourcing production to China that was the real cause of America's woes. How can agricultural land remain many, many times cheaper than urban land everywhere worldwide, if mankind is running out of space? Ultimately, if mankind "runs out of space", wouldn't it become equally economic to use land either for agriculture or urban development? Food prices would have to be very much higher of course. Juergen Voegele, director of agriculture at the World Bank, says in the report that “given commodity price volatility, growing human and environmental pressures, and worries about food security”, interest in farmland is rising. “The demand for land has been enormous,” he writes in the study’s preface. You just have to read what is there, without your denial glasses on. Surprisingly, one can make a very good case that agricultural land in NZ is not overvalued despite showing a miserable 2 or 3% ROI - you could say the product of the farm is grossly undervalued. To develop a dairy farm up from scrubland - that's all the clearing, cultivation, sowing, fertilizer, fencing, roads and races, power and water supply, effluent system, miking shed, feed storage, operator accomadation etc is very close to the current sale prices of about $35/kg. m.s. So the bare undeveloped scrub land has virtually nil value. And that's fairly typical for most resources, what value do we put on our fish stocks or mineral reserves - nothing in most cases, they certainly don't show anywhere in the national set of accounts. We are receiving an absolute pittance in royalties(in relation to the vast profits) from our gold miners for example. Things are about to get very interesting though and that's why we're seeing resource grabs from China in Africa (and NZ?) For example; as we hit peak oil, how willing will the oil exporters be to keep the cheap oil flowing? Could we see a break away from some of them from their price fixing cartel if it comes under US pressure? Why wouldn't they want to reduce output, force the price up and look forward to many more decades of oil based prosperity? So the answer to our future prosperity is to buy shares in US tech companies? What would you call asking me to google four company names for no stated purpose? "We should invest more in these kinds of things." The rest of your comments are not positive suggestions at all. Agricultural land once subdivided, is worth much more than what it is as straight agricultural land. I like what they do in the Netherlands. 'Lifestyle' blocks there are allowed but the land if originally classed as agricultural land, has to be leased back to genuine agriculturalists. Friends over there have 5 acres with a house. They get to use about an acre (they run a business from home) and the rest is leased to a local farmer. Their whole 'street' is subjected to this designation. It allows urban sprawl while retaining the 'look' of the rural landscape. Some blocks are zoned for semi-detached dwellings. Re China's speculative property bubble, "The Hugh thesis" is quite valid here. If the authorities simply "sold" (or leaseholded out) enough land, this kind of speculation would be impossible. China's bureaucrats have worked out, like any Monopolists, that they will get more for the land if they ration it out slowly. They have the perverse incentive that land "sales" are their main source of revenue. They could either sell more of it; or sell less and drive up the price. They are generally choosing the latter course. True. With heading for 9 billion people and dwindling supplies; food, water and shelter become the things. The just-in-time food system drove prices down, and the displaced income (including the freed-up housefrau who promptly went to work) went into aquisitions which had to be stored in, around, or as part of, real estate. So they were out of whack, temporarily. You can tell the folk for whom the penny has dropped in this country - the explosion of vegie gardens, farmer's markets and chook-keeping aren't happening for nothing. With agricultural production, space to live and an uncontaminated environment being the most precious commodities of the future, it makes perfect sense that should we exchange ours for pretty little bits of green paper. Let us not be rascist however. WE can sell what is most precious for our children's future to ANYFOREIGNBODY as long as they have the cash. We could even sell them our children and our parents. Lets be modern!!! You have to wonder what was the real story behind Jack swapping the family cow for 5 magic beans, and what the beanstalk and golden eggs represent. Of course, the beans were probably mushrooms, and you wouldn't get an RMA approval for the beanstalk, although you might be able to keep it as a significant tree. You'd need safety harness up beyond the first bough, too, presuming it qualified as a workplace. The milk from the cow, of course, went overseas. It is all so simple. We have such a great chance to do good for ourselves and our offspring- but we will hand it all away to friendly, smiling strangers. I think we need to secure our boarders, become energy self sufficient and quietly withdraw as much as possible from globalization and free trade. It is as if we had a rugby tournament with all the rugby teams in NZ- from schoolboy, schoolgirl rugby right up to the mighty All Blacks. Say the winner of the tournament took EVERYTHING-stock, lock and barrel. What do you think would be the ultimate result- after a few surprises and upsets to spice things up? The All Blacks would beat everyone. Free Market Capitalism is just a big game (warfare maskarading as a game). It is deadly serious and always has been. If we go waltzing in there with a big grin on our faces, our to make friends- we are going to get (we are getting) reemed out till we cannot stand up. This game is for keeps. It is not like the Olympics where you dust off your pride and work hard for the next one 4 years later. If we lose this game, we could become slaves or worse. Just read 50,000 years of history. The hunter puts cheese in the trap to lure the prey. #3 Noel Leeming camera is obviously dangling on a piece of rope and swinging gently - very misleading footage. Yeah ; first time I ever saw so much action in a Noel Lamington store ! New Zealands farm lands should be the most expensive in the world because no other place has that ammount of rain fall per year. Mind you the Chinese already control a large part of Brazil's agriculture. I've been told that most of the machine operators are flown in from China and Corea for the harvest.